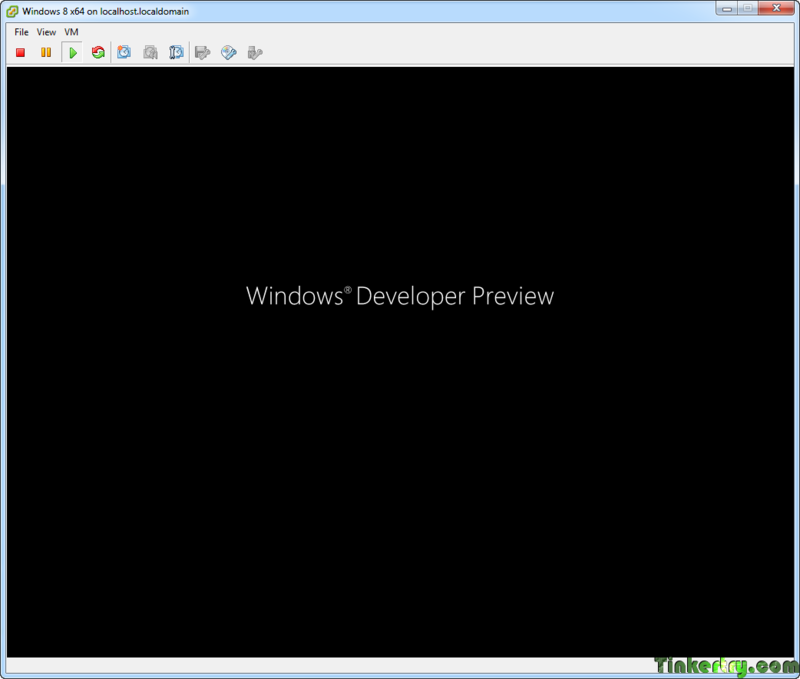 Windows 8 Developer Preview Now Available for Download, but can I run it in VMware Workstation 7.1.4 or ESXi 5.0? Tuesday Sept 13 8:20pm eastern time, while attending a Microsoft virtualization user group, I spotted this article on lifehacker.com, announcing the Windows 8 Developer Preview download availability. This was earlier than the 11pm eastern time the blogs were predicting. So, I remotely kicked off the download at around 8:30pm eastern time, and it took until about 10:30pm to finish. 2 hours, not bad. Next, had to give the version of VMware Workstation, 7.1.4-build-385536 a try, since it's the latest version and already installed on my laptop. 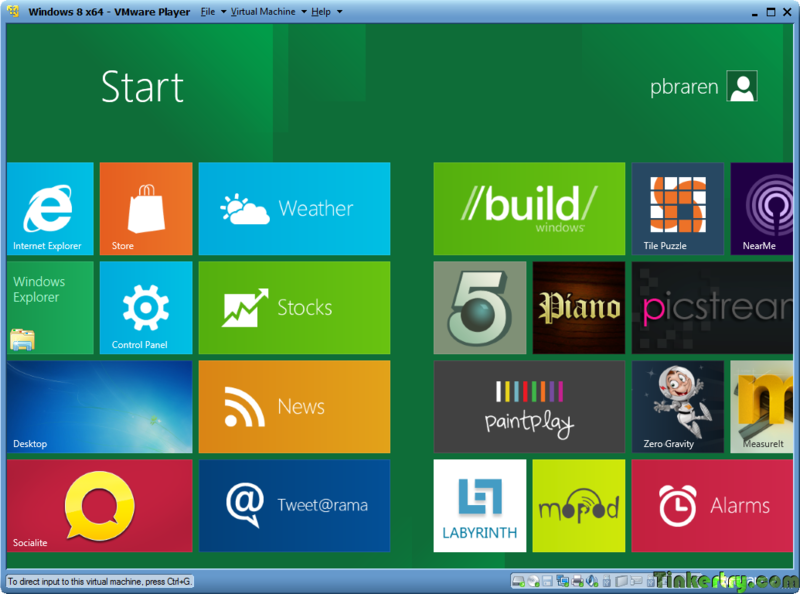 "Windows 8 Developer Preview Now Available for Download, but can I run it in VMware Workstation 7.1.4 or ESXi 5.0?" Well, it's complicated, short answer is No and No. But there's some good news too. Workstation 8.0 tools install fine, and the default install also installs free VMware Player 4.0, which isn't currently available as a separate free download. But, more good news, Player does run Windows 8 fine as well (screenshots below), not sure what happens after 30 day trial of Workstation ends. Maybe has now become a No! 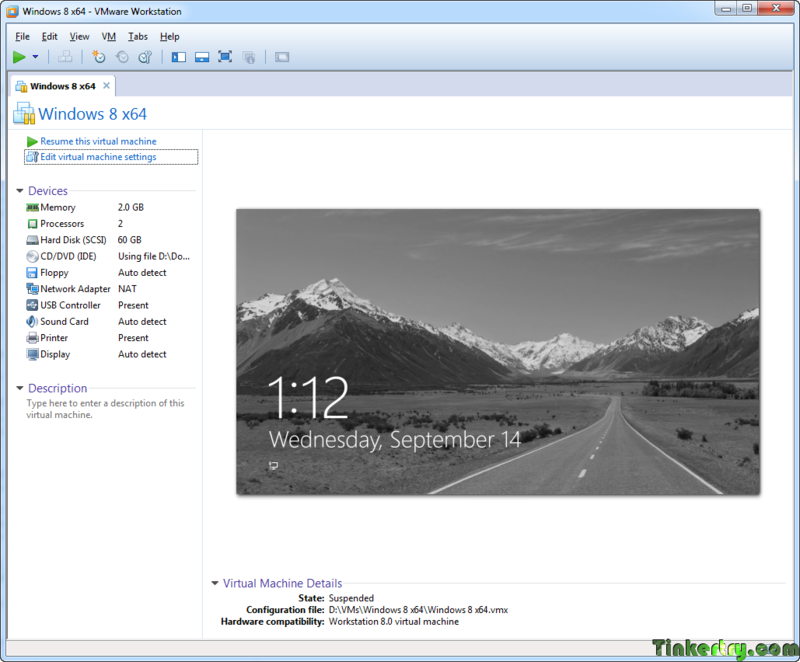 Sep 16 2011 10:00am: Newsflash, virtuallyghetto author updated his site stating ESXi doesn't work with Windows 8 after all! VMware Workstation internal monitor error *** vcpu-0:NOT_IMPLEMENTED vmcore/vmm/intr/apic.c:1903 Please report this problem by selecting menu item Help > VMware on the Web > Request Support, or by going to the Web page (super long URL shortened to http://vmware.com/info). Please provide us with the log file (D:\VMs\Windows 8 x64\vmware.log) and the core file(s) (D:\VMs\Windows 8 x64\vmware-core.gz, D:\VMs\Windows 8 x64\vmware64-core.gz, D:\VMs\Windows 8 x64\vmware-vmx-792.dmp). If the problem is repeatable, please select 'Run with debugging information' in the Options panel of Virtual Machine Settings. Then reproduce the incident and file it according to the instructions. To collect data to submit to VMware support, select Help > About and click "Collect Support Data". You can also run the "vm-support" script in the Workstation folder directly. We will respond on the basis of your support entitlement. We appreciate your feedback, -- the VMware Workstation team. ESXi 5.0.0 469512 intial test results No success to report. Upon pressing "Play" in the console to start the boot from the ISO, I get "Loading files..." for a second, then "Windows Developer Preview" on a black background for a few seconds, then the VM turns right back off a few seconds later (see screenshots below). I get this nasty behavior even after changing the initial Windows 7 x64 settings over to the new Windows 8 x64 settings. I'll need to next make sure my ISO isn't corrupt by installing on a physical machine, but I doubt is, as others reporting the same issue in Disqus comments below. But meanwhile, I'll just ask, any ideas on other tweaks to try, anybody? Downloading the 32 bit version now, regretting not kicking off that download earlier tonight, saying it'll take about an hour for that 2.8GB WindowsDeveloperPreview-32bit-English.iso Will see if I have any better luck with that version in VMware Workstation and ESXi 5.0 (and note, if you're a VirtualBox fan, it's known to work fine there, read details here). This feels very much like the tweaking I used to have to do to get ESX running inside VMware Workstation years ago: once folks tweaked the ".vmx" file enough, we got it working, unsupported of course. But this time, not seeing anybody else with answers or insight into these particular behaviors quite yet. And this is whole different animal, of course. I'm also noticing nearly realtime conversation with the folks commenting below (Disqus comments system), my most active night ever, by far (hundreds per hour). So I'm beginning to rethink my taking down my prototype IP.Board forum page with its chat function. Or maybe we go with Google Plus Hangouts? Or something like it, for just such occasions as this. Would folks be interested? Please use Disqus to comment below to speak your mind! Using the WindowsDeveloperPreview-32bit-English.iso version, I get this, dare I say, cute error? 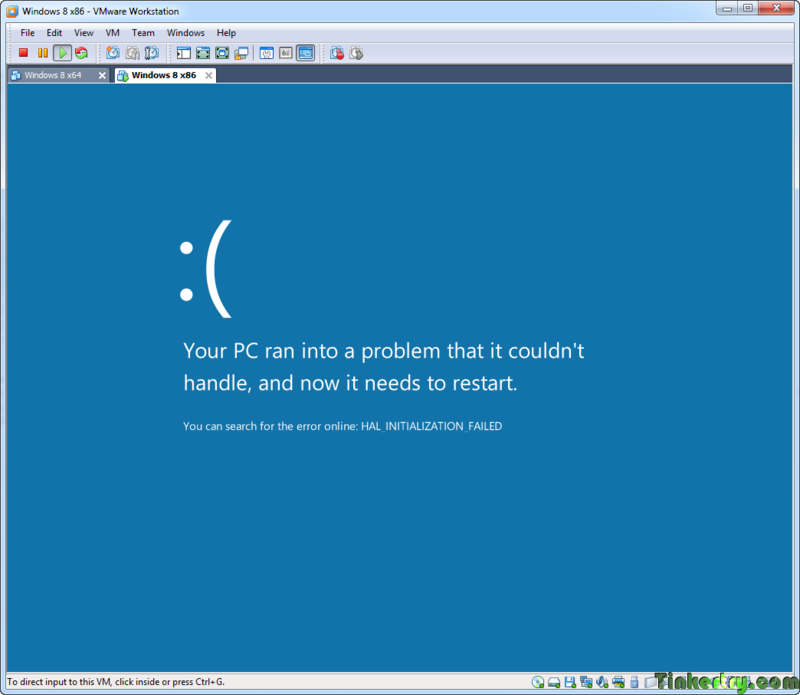 Using the same WindowsDeveloperPreview-32bit-English.iso with Virtual PC (XP Compatibility Mode) resulted in the same happy blue screen. Totally different, somewhat convoluted method may work? I basically installed Windows 8 Developer Preview on a ThinkPad, installed the vSphere 5.0 Converter on that ThinkPad, then cranked through the wizard to output a Workstation 7.0 compatible image to local SSD drive (so it finished fast). I then copied those files to my VMware Workstation laptop local hard drive, and of course, it fails, same "vcpu-0:NOT_IMPLEMENTED" error. So now I'm thinking, what if I crank out another conversion, which goes very fast since it's SSD cloned over gigabit to a RAID0. 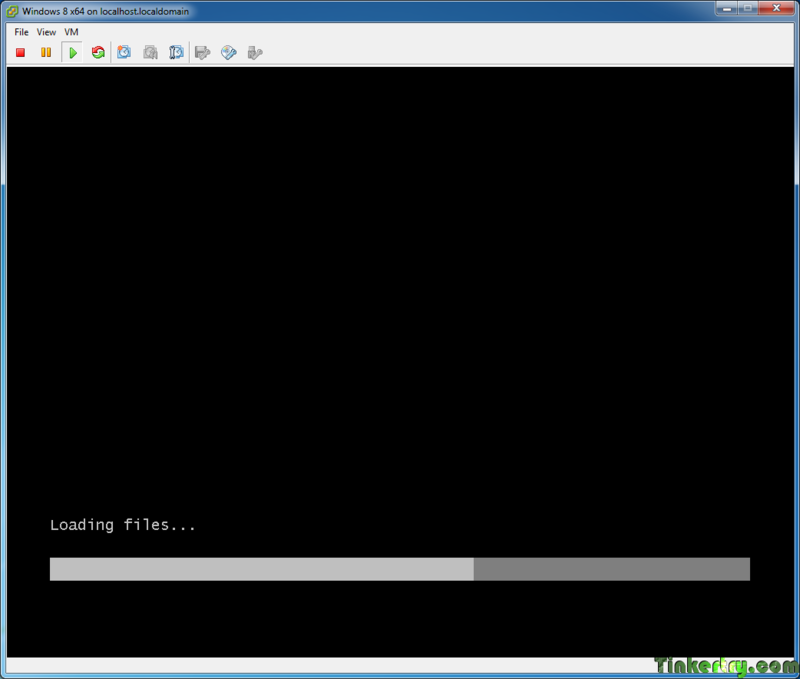 But this time, I'll try a VMware Workstation 8 compatible image. I realize it'll puke when powering up on VMware Workstation 7.1.4, but I already found a simple workaround for that last week, explained here (with screenshot). Trying that out now, not holding out too much hope, we'll know the result soon. Even if I just get a different error than all the other tests above, I'll have learned something. And since this VMware Converter 5 was meant to be used with the very recently released vSphere 5 and/or Workstation 8, it seemed like a decent idea to give this physical to virtual idea a shot, especially if it works. I can then learn from the working .vmx file it produces, and maybe even figure out how to install a VM from scratch (without having to install Windows 8 on a physical machine first). Conversion completes without incident, but then the VM dies (powers off) shortly afterpowering on, sigh. Subsequent boot attempts yield this result, see screenshot. There it is, the tweak that should get Windows 8 working in ESXi 5.0 as well, way to go, whoever you really are, seriously, great find, thank you for sharing! So you can run Windows 8 on VMware Workstation 8 (and maybe ESXi 5.0), that appears to be our group conclusion, finishing up first hand tests now. 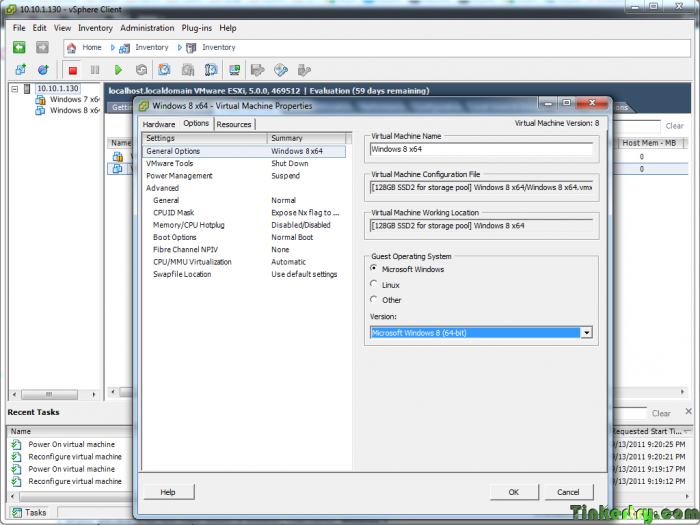 Here's here's post, it's the critical missing link we ESXi 5.0 users were hoping for! 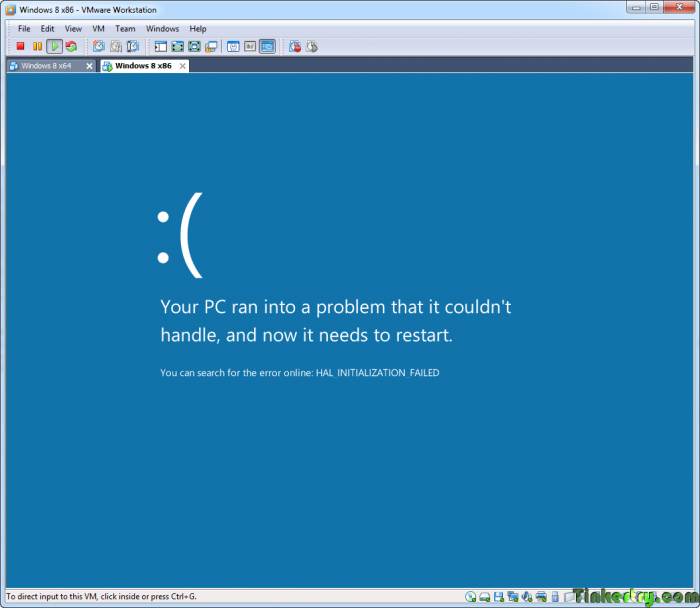 If you've read this far through this blog, I suspect you're pretty good at handling yourself with VMware Workstation/VMware Player. 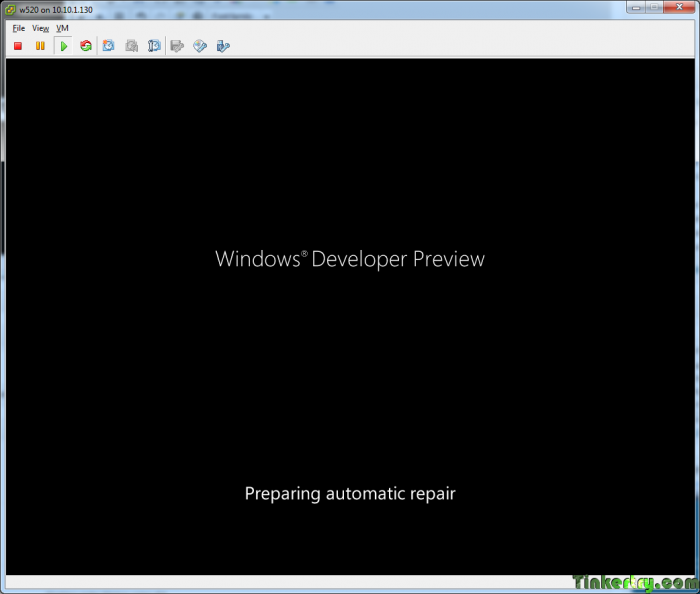 However, I've found two particularly detailed walk-thrus for installing Windows 8 Developer Preview on VMware Workstation that you may also enjoy. Have a great weekend! Windows Server 8 also works with VMware Workstation 8! Thank you for posting the following extremely helpful information in the comments, PGermanus! 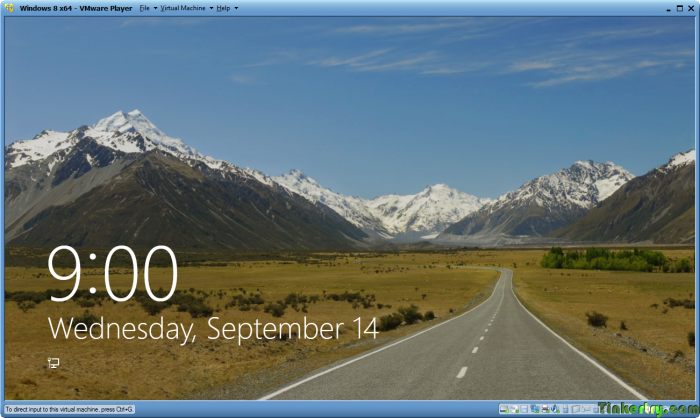 Windows server 8 also works fine in VMware workstation 8. Just don't install the VMtools, because the serverversion doesn't work correct with the video drivers of VMtools. You get a black screen with only the mousepointer and the notifications. You can try everything else without the VMtools (internet works) but it won't run as quick or smooth as you'd like. but since the actual page is gone, no way to subscribe to notifications when VMware has fixed this that I can find. Update, new Windows 8 Consumer Preview now works fine on ESXi 5.0 Patch 02, read all about it!